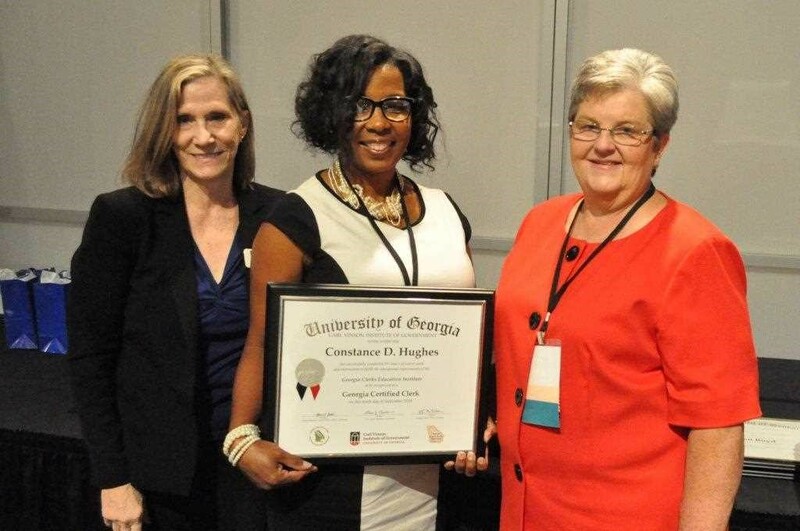 Twin City City Clerk Constance Hughes graduated from the Georgia Clerks Education Institute (GCEI) as a Georgia Certified Clerk. The graduation ceremony was held on September 10, 2018 in conjunction with GCEI Fall Conference held at the University of Georgia Center for Continuing Education. The certification requires the clerk to complete 101 hours of course work and increases the managerial competence of the municipal clerk to meet the new challenges and demands placed on local governments. The Georgia Clerks Education Institute is a program of the Carl Vinson Institute of Government at the University of Georgia. “We are very proud of Connie. She’s the first clerk in the history of Twin City to complete this rigorous certification. It demonstrates her dedication to Twin City and her profession” said Mayor Pro Tem Matt Donaldson.